The Sixth Street Embankment, a target of preservationists and developers alike has had some problems in recent weeks. Yesterday chunks of the stone wall began falling from the section west of Erie Street. The fire department cordoned off the corner to protect pedestrians. Several weeks earlier the embankment, the section of the Embankment at Marin Blvd caught fire. 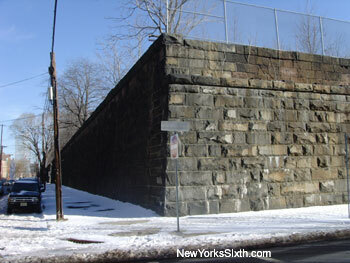 The Sixth Street embankment once supported eight elevated rail lines connecting the Jersey City waterfront with rail cuts through the Palisades Cliffs and served as one of several conduits for goods coming and going from the port and industrial complexes along the river. The tracks have long since been abandoned. In more recent years, developer Steve Hyman has been attempting to gain approval to construct housing either on top of the embankment or on the property after removing the structure. Local preservationists would like the embankment converted to an elevated park, similar to New York’s High Line Park, now under construction and set to open this summer. The main point of contention in the struggle has been an illegal sale of the property by Conrail to Hyman; railroad properties, particularly right of ways, must follow a specific process before being sold off as private property. In addition to Hyman’s plan to construct housing on the property, Mayor Healy has floated using the property for an extension of the light rail system, connecting the waterfront to the Secaucus Transfer station via the Bergen Arches. The plan would provide mass transit access to the Heights neighborhood. In an attempt to appease Healy’s administration, Hyman then floated a plan to construct both housing and a light rail line connected to Journal Square. Preservation groups insist on building a park and no light rail line.